Finally, a pocket guide to buying furniture that offers no-nonsense reviews of the best shops. 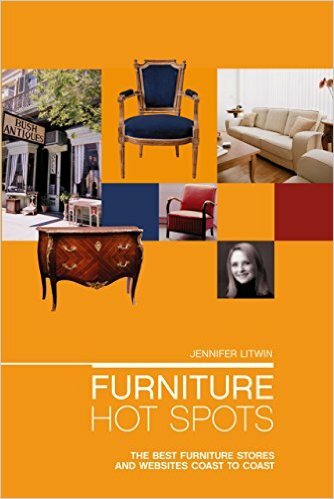 It’s the book Jennifer Litwin needed the first time she went furniture shopping without being able to tell what type of furniture store she was about to walk into. That was a long time ago, and Jennifer Litwin has since become one of America’s premier furniture brokers. Her book is for anyone who has ever felt intimidated by the unregulated market, and wanted a down-and-dirty guide to shopping for all kinds of furniture, all over the country. Cut to an easy-to-carry size, and sharply focused, FURNITURE HOT SPOTS will help both first time buyers, as well as the more seasoned shopper. The core of the book tells readers where to find what they’re looking for, depending on where they are in the country, and how to determine if it’s fairly priced. Litwin divides the nation into ten regions and provides info-packed reviews of everything from upscale urban boutiques to barn-style shops. Each seller is profiled concisely, with phone numbers and Web sites, as well as comments about the quality of the stock, the kind of items the store specializes in, and the knowledge of the sales associates. Also included is invaluable tips on how to buy at auction, the best way to navigate flea markets and chain stores of all price ranges, and great hot-spots on-line, many of which are also reviewed. This is the essential guidebook no furniture search should be without.